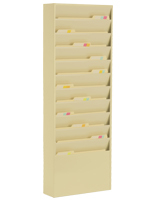 11 Pocket file holder keeps charts & info neatly organized. 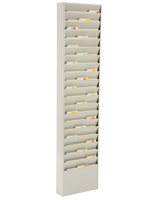 Designed for wall mount use, to keep folders off desks & within arms reach. Steel make with black, powder-coated finish for durability. Neutral black coloring to coordinate with any office decor. Powder coating is rust & acid resistant for years of use. 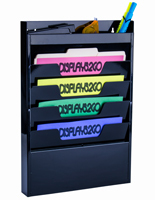 This chart display fixture, wall mount file holder is designed for use within office and business settings. These units feature a neutral black coloring and are sure to coordinate with any décor. 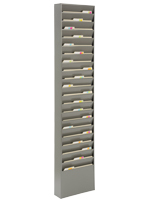 The wall mount file holder is often seen used in doctor's offices, holding patient charts and information within a reception area. 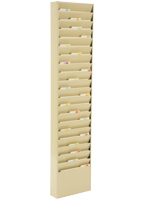 Hospitals also make use of this type of fixture, to display charts outside of a patient room for doctors and nurses to easily access the information before entering. 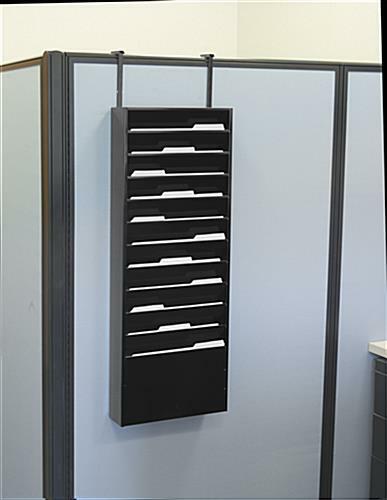 Businesses often use this wall mount file holder to present outgoing mail or other types of information in an organized manner. 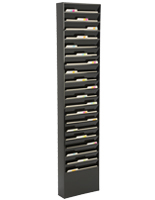 Users could also purchase more than one chart display rack, and mount them side-by-side, to make information centers as well. 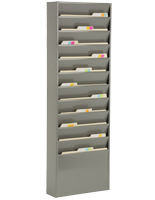 This wall mount file holder, also called a medial chart display, mounts to the wall, keeping displayed information neatly organized. 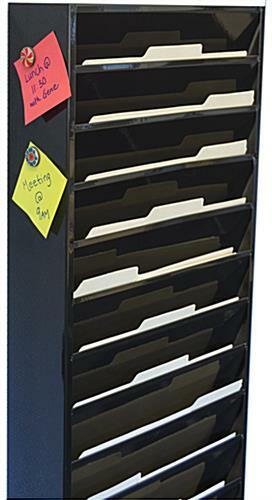 Constructed from steel with a black, powder-coated finish, each chart organizer is durably designed. 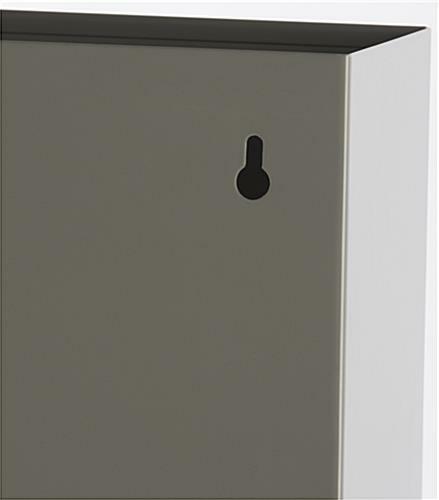 The finish is both rust and acid resistant, ensuring each wall mount file holder will last for many years to come. 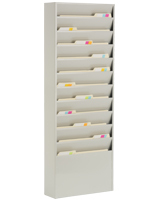 The wall mount file holder features 11 pockets, each of which fits standard size folders. Please Note: Hangers are not included. 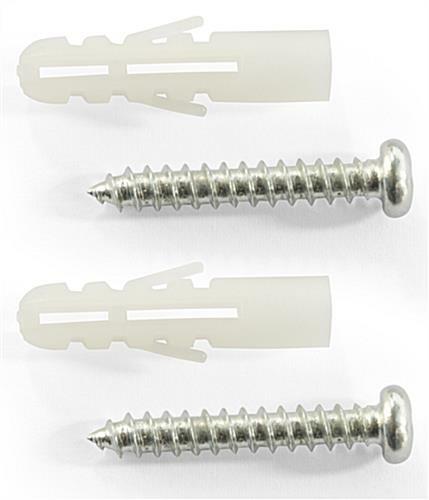 12.4" x 8.4" x 0.75"
GREAT product! Very durable and presentable...we've now ordered several! LOVE this piece! Thank you so much for the excellent review, Amber! We're thrilled that you love our products as much as we do, and we hope you'll continue to use Displays2go for your display needs! Hi Carol, One of our customer care specialists would be happy to assist you! Thank you for making us aware of this. Order processing and delivery were exceptional. Product received (4ea) had poor powdercoat cosmetic appearance quality. Lots of sags and textured appearance on 2ea of the products. Hi Gary, We're sorry to hear you're not totally satisfied with the quality of your order. One of our customer care specialists will be able to assist. Thank you for letting us know! decription accurate, one of the trys weld popped loose in shipping doesn't affect function just a nuisance, and does not speak well of quality. Hi Dave, We're sorry to hear you're unsatisfied with the quality of your purchase. one of our customer care specialists will reach out promptly to assist. Thanks! Our sleek, new, semi-gloss black 11-tier hanging file folder has replaced our old, homemade 7-tier wooden piece, and our crew is quite happy with the new addition to our break room. Thanks so much for your helpful product!